Many Utah residents are surprised to learn there is a large lake just 10 minutes from downtown Provo and 40 minutes south from Salt Lake City. 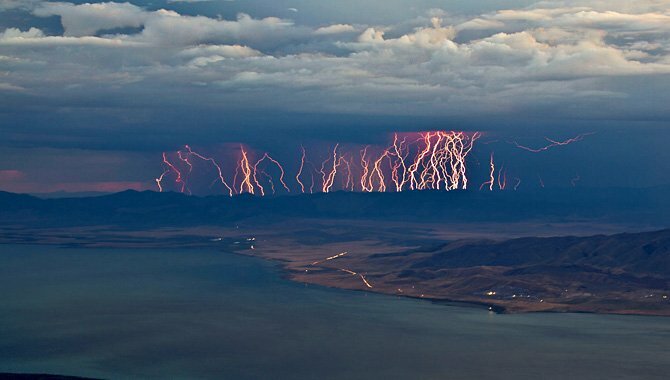 Maybe that’s because the Great Salt Lake steals all the thunder of being such a large body of salt water, (the early pioneers thought they had reached the shores of the Pacific Ocean). 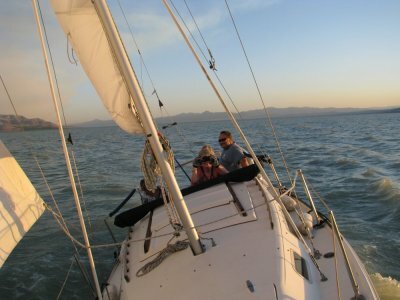 Utah Lake can push back with the distinction of being the largest body of fresh water west of the Mississippi, measuring 24 miles long and 13 miles across. Along with Bear Lake, these three bodies of water are the largest remnants of ancient Lake Bonneville, which covered most of Utah and parts of Nevada and Idaho. 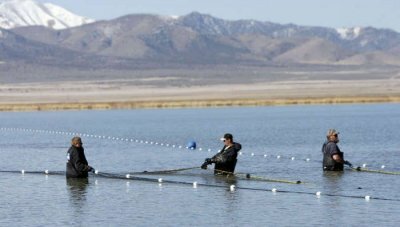 An unusually shallow lake, Utah Lake averages just 9.4 ft. This shallowness allows winds to easily stir up sediments from the lake's bottom, contributing to its turbid appearance. About 14,500 years ago, the lake level fell catastrophically as Lake Bonneville overflowed near Red Rock Pass, Idaho and washed away a natural dam formed by opposing overlapping alluvial fans. The lake level fell some 350 ft. to what is now the next lower bench (the "Provo level") in a flood that geologists estimate to have lasted up to a year. This breach released approximately1,000 cubic miles of water in the first few weeks. 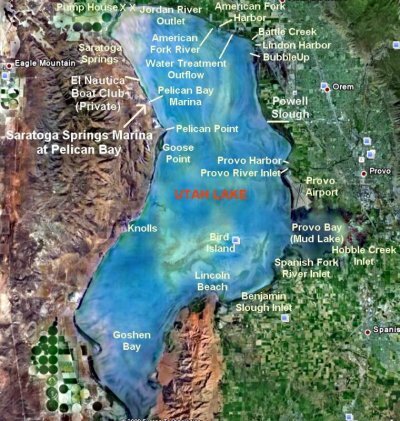 The Provo level is the most easily recognized shoreline feature throughout the Bonneville basin and is distinguished by thick accumulations of tufa that formed near shore during the 500 years that the lake was at this level. The Dominguez / Escalante expedition of 1776 was the first group of Euro-Americans to enter Utah valley, exploring the ecosystems of then Laguna de los Timpangos. Paleo, Archaic, Fremont and Ute tribes depended on Utah Lake for food, building materials and transportation during those early years. Development along the lakes shoreline began as amusement resorts operating in the late 19th and early 20th centuries at Saratoga Hot Springs in the northwest corner of the lake, and at Geneva in the northeast. Geneva (named after the owner's daughter, not the lakeside city in Switzerland) was built where the Lindon Marina is now, at the point where the railroad came closest to the lake. It included a hotel, swimming pools, a dance floor, and water slides. 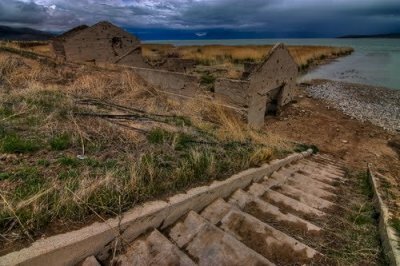 The current site of Utah Lake State Park began improvements as early as 1930, with the lakes first boat harbor facility. Other smaller marinas can be found at Saratoga Springs, American Fork, Lindon, and Lincoln Beach. The world-renowned Iron Man competition was staged at Utah Lake State Park in 2002 during a catastrophic windstorm that resulted in one fatality. Over 200 species of migratory birds use the Utah Lake Wetland Preserve as part of their flyway route. Pelicans can routinely be observed skimming along the lakes surface. Close into marshlands, ducks, geese and diving birds are commonly encountered. Major tributaries include the Provo, Spanish Fork, and American Fork rivers, as well as Hobble, Mill Race, and Currant creeks. with the Jordan River carrying controlled agricultural water north to the Great Salt Lake.